Jyoti Gawate has been podium finisher multiple times at the Mumbai Marathon, India’s biggest annual event in running. Focused on the marathon and lacking in resources, she trains back home in Parbhani with none of the facilities that grace elite coaching circumstances. Her’s is a story tinged by what if. What if she had the support and ecosystem others enjoy? 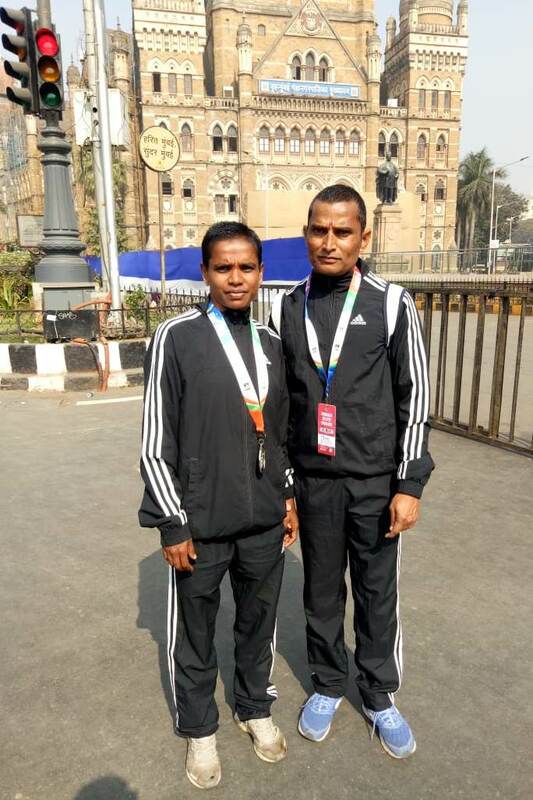 On January 20, 2019, two runners – both around 32 years old and assigned to the Indian women’s elite category – lined up at the start of the year’s Tata Mumbai Marathon (TMM). Their respective trajectories in sport were quite different. In her 32 years, Sudha Singh had become national record holder in the steeplechase, Asian champion in the discipline and represented India at two Olympic Games. Given the marathon has for long been favored hunting ground of athletes specialized in running’s middle distance formats, she was also among India’s leading woman marathon runners. In fact, at 2019 TMM, Sudha who works with Indian Railways was the defending champion. 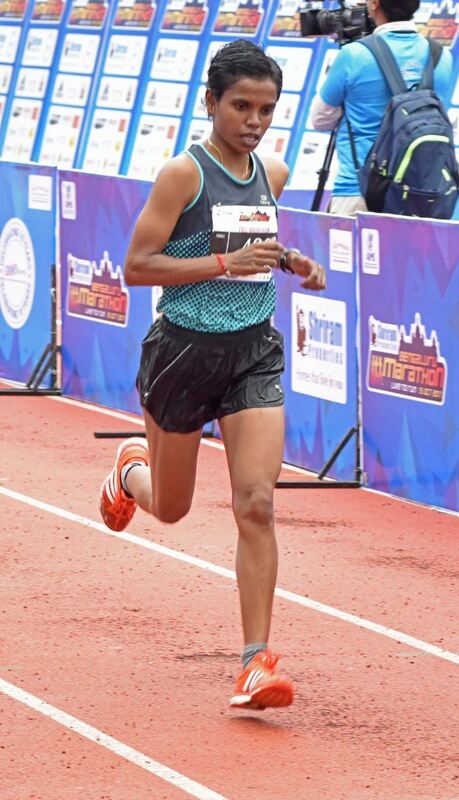 Jyoti Gawate on the other hand, was the winner among Indian elite women in 2017; she had finished two minutes behind Sudha in 2018 to secure second place. That year Mumbai’s Mid-Day newspaper summed up her predicament in a post-race report. She had won 15 of the 30 full marathons she participated in, including the Allahabad Marathon five times in a row. “ I am still jobless; what more can I do?’’ the paper quoted her as saying. In every marathon, the start and the hours of running thereafter are pristine. No regrets; only goals, maybe even blank head. At the start line of 2019 TMM, there was a goal for Indian elites to run to. That edition of the Mumbai Marathon was widely perceived as among last chances to meet the timing required for participating in the IAAF World Championships due in Doha, Qatar, later in the year. For women, the cut-off time for Doha was two hours, 37 minutes. Sudha had a personal pacer – Vicky Tomar, a steeplechaser she trained with in the national camp. They knew each other’s style of running. The race organizers had provided Jyoti too, a pacer – Marius Ionescu, a Romanian long distance runner who had been to the 2012 London Olympics; he had also been winner and runner up at the Dusseldorf Marathon, his best timing there being 2:12:58. She completed the race in 2:34:55, a new course record. Jyoti finished second in 2:45:48, cutting five minutes from her timing at the 2018 Mumbai Marathon. According to her having Marius as pacer helped. At the start of the race, she had nursed mixed feelings about her prospects. On the one hand, she felt she could get to 2:40; on the other hand, she was worried if she would improve her timing at all. “ The pacer helped me a great deal. He chalked out the entire plan on how to run the distance. He helped me maintain the pace. I completed the first half in 1:20. After that my speed suffered a bit. But the pacer helped me maintain the speed during the second half of the race,” she said. The splits tell the story. Sudha ran the first two splits at 16.1 km / hour each and the last two in 16.3. For Jyoti, it was 16, 15.5, 15.4 and 15.3. Jyoti managed a personal best. However, it was far from the remarkable result Sudha produced. Sudha became eligible for selection to the Indian squad for Doha; Jyoti didn’t. Contacted some days later, Jyoti was – as usual – back to training in Parbhani, the district in Maharashtra’s Marathwada region that she hails from. Her work was cut out – to knock off was eight minutes; that’s the gap between her new personal best and the qualifying time for Doha. She had one race left to accomplish it – the National Marathon Championships in New Delhi scheduled for February 24. Born February 1987, Jyoti has been running the full marathon for the last ten years. In the very first marathon that Jyoti participated – Standard Chartered Mumbai Marathon (SCMM) as the Mumbai Marathon was known then – she finished the run in 3:12 hours and placed second on the podium in the Indian women’s category. The following year, she finished the race in 3:05:29 hours emerging winner among Indian women. Jyoti has been running the Mumbai Marathon for the past ten years securing top position among Indian women in 2011 and 2017 and second position in 2010, 2018 and 2019. Running marathons is livelihood for Jyoti. The prize money she earns from the races that she participates in helps her contribute to her family’s modest finances. Her father, Shankarrao Gawate, retired as a class four employee from government service. Class four-job in government service often refers to service as peon, sweeper and attender. Her older brother Ravindra works as a police constable. Her younger brother Kiran is yet to find proper employment; he too is trying for a job in the police. As part of formal education, Jyoti did her BA and B.P. Ed (Physical Education). In 2014 she secured employment with Mumbai Police but quit after eight days because she feared she may not get time to train for the marathon. “ I would have had to wait for one year to find out if I would be part of the sports team or not. I could not afford to lose time. In that period, my running career would have ended,’’ she said. Jyoti has won many of the races she goes to. But long-term support has remained elusive. She hasn’t been able to get any job, brand support or sponsorship or for that matter, an invitation to join the national camp for the marathon. She tried for a job with Indian Railways, employer for many sportspersons. At age 25, she submitted her application for a job with them. She heard nothing. She hasn’t seriously pursued other avenues of work like being a sports teacher at a school. She is therefore forced to participate in races including 10k, half marathon and full marathon and earn money from podium finishes. A podium finish as elite athlete in some of the major marathons helps her get prize money bigger than what is offered at smaller races. Her elder brother supports the family. Jyoti’s earnings add to it. Life’s rigors shape character. At the Mumbai Marathon, Jyoti is a recipient of pre-race hospitality from Procam International, the organizer of the event, if she has been a podium finisher in the previous year. “ In 2011, she was offered accommodation at Trident Hotel in South Mumbai but she felt uncomfortable about staying there. She therefore stayed at the legislators’ hostel in Colaba,” Ravi Raskatla, her coach, said. Indeed for some years thereafter, whenever she came to Mumbai for the annual marathon, she stayed at the legislators’ hostel. For 2019, Procam arranged her stay at Hotel Supreme at Cuffe Parade. “We always travel by train from Parbhani to reach Mumbai for the race. We leave the morning after the race as we like to collect all the newspapers before heading back to Parbhani,” Ravi said outlining the pivots on which the annual outing hung. Travel by train, sleep, a marathon run, newspapers collected to keep memory of event and performance, alive – beneath the hype and marketing of modern day running that’s life stripped to bare bones that count. Jyoti got introduced to running during her school days at Prabhavati Shala in Parbhani. She began running the middle-distance disciplines – 3000 meters, 5,000 meters and 10,000 meters. “ During my school days, I participated in some races but there was no structured plan to it. There was no training either,” she said. In 2003, she got into running more seriously. “ I enrolled for a 12k police run in Parbhani. That’s when I started training to run,” she said. Two years later she was spotted by coach Ravi Raskatla, who took her under his wings to train her. “ Unlike many elite marathoners, who are also into other track and field events, Jyoti focuses on marathons,’’ he said. 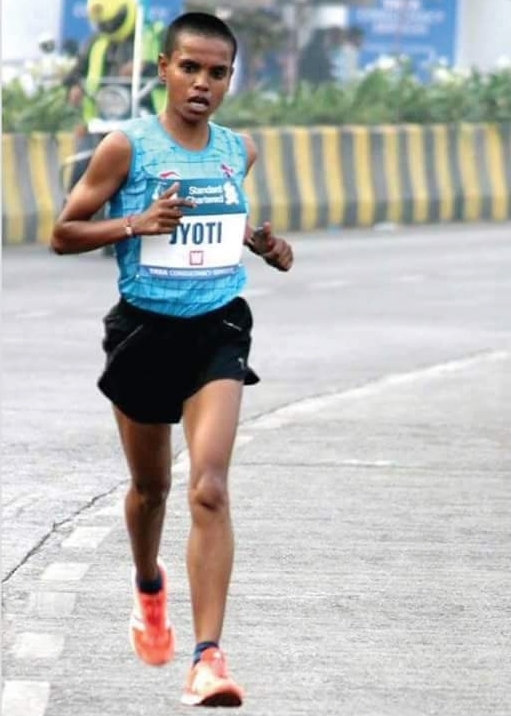 Of the 35 marathons that Jyoti had participated in by early 2019, she had won 16, ended in second position six times and in third place, thrice, he said. She has been a winner at multiple editions of the Allahabad Marathon, Hyderabad Marathon and Bengaluru Marathon. In 2011, she took part in the Asian Marathon Championships in Thailand and finished seventh among women with a timing of 3:17 hours. She was selected to run in Thailand because of her win at the 2011 Mumbai Marathon, where she was winner. The Athletics Federation of India (AFI) funded her trip and stay. In 2018, she ran the SCO Marathon in China finishing in ninth place with timing of 3:02 hours. It was AFI that invited her to run at the event. They also funded her trip. However none of this support – valuable as it is – ever progressed to an invitation to be in the national camp, something athletes dream of given the superior facilities in that ecosystem. Jyoti now hopes to get closer to the required qualifying timing for Doha, at the National Marathon Championships, New Delhi. Dilip Patil is retired deputy commissioner (sales tax), and an ultra-marathon runner. He has participated in the New Delhi marathon before. “ The course there is much better and the weather is also pleasant compared to Mumbai,’’ he said. He has been running for the past 14-15 years. He has completed the Comrades Marathon in South Africa several times. Dilip is one of the organizers of the Amaravati Half Marathon, where Jyoti has been running and winning. “ Jyoti and a group of runners hailing from similar background like her come and participate in the Amaravati Half Marathon. We organize their stay for the race,” he said. Jyoti gets some financial support from individuals in Parbhani including doctors and businessmen but no sponsorships. In 2017, she approached a prominent state politician for assistance. He promised to help. She heard nothing thereafter. Dilip believes Jyoti will be able to reduce another ten minutes from her marathon timing if she has access to scientific training and proper nutrition. We wrote to Matt Fitzgerald, the U.S. based coach, sports nutritionist and author of many books on running, about Jyoti’s prospects for improving her marathon timing over the next one year period. “ Jyoti can improve if she raced less, improved her diet and did some strength training. In the absence of these changes, I expect that any improvement she does experience in New Delhi will be due entirely to more favorable weather conditions and possibly if she finds herself on pace in the late miles,” he replied. With Delhi’s weather expected to be much better, Jyoti would be able to run about four minutes faster assuming everything besides the weather is the same, Matt said. “ I don’t feel any pressure from the Doha qualification norms. My training is good and I am confident it will carry me through. In Delhi, the weather is much cooler; that should help me run better,’’ Jyoti said. Further, the race in Delhi starts at 6:30 AM as compared to Mumbai’s 7:40 AM start. Her coach believes she will be able to come within striking distance of the elusive mark, soon. “ She should be able to get to 2:40 at the National Marathon Championships,’’ Ravi said. The IAAF World Championships in Doha is not the only event out there to aspire for. In 2020, there is the Tokyo Olympics. Given there is considerable time to be lopped off before sub-2:37 is reached, the coach-ward duo is also looking at the possibility of enrolling this year (provided funds are found) for the London Marathon in April and Berlin Marathon in September to help achieve the qualifying time. “ Though Doha Championships would be out by then, hopes for 2020 Tokyo Olympics remain alive,’’ he said adding that the Berlin Marathon would be followed by another Mumbai Marathon and the National Marathon Championships. As per the rules of the International Association of Athletic Federations (IAAF), the qualification period in marathon for 2020 Tokyo Olympics runs from January 1, 2019 to June 29, 2020. However, it must be borne in mind that the selection process for elite events has been tightened by the IAAF; it is more than just timing now with athlete ranking and participation at multiple races also factored in. Amid all the challenges she has faced, one factor that has been favorable for Jyoti has been the absence of injuries. “ She has not had any injuries in the last several years she has been running marathons,’’ Ravi said. Running as she does to make ends meet, Jyoti does not believe she is racing too much. On the contrary, every time she races she feels rejuvenated. “ I have to participate in races because the money I get so helps me buy shoes and food,’’ she said. Participating in high profile events like the Asian Championships, World Championships or Olympics is extremely beneficial for athletes like Jyoti. “ If I get into any of these, it is possible for me to get grade one job in government service,’’ she said. In seven years of participating at the annual Mumbai Marathon, Rimo Expeditions’ team of runners from Ladakh, have made it to the podium for elite Indian women, twice. The time taken by these women runners in the full marathon – they represent the new generation of runners from Ladakh – is yet to dip below three hours. But they are within striking distance despite the limitations in which they train back home. There is a sense of what’s next opening up in the program. Key to it is Indian sports authorities taking note of the improvements in performance made. Question is: will they? Jigmet Dolma remembered the first time she ran in the elite category at the Mumbai Marathon. She and fellow runner from Ladakh, Tsetan Dolkar, reported to the start line of the 2017 edition of India’s biggest marathon. It was a year when the field in Indian women didn’t have some of the prominent elite runners. But elite is nevertheless elite; the atmosphere is more purposeful, a sense of aim prevails. At such levels of competition, even relaxation is ingredient for enhanced performance. As runners warmed up ahead of battle, the duo from Ladakh felt nervous. “ I was a bit scared,’’ Jigmet said. But being underdog helps. Many runners who secured podium finishes in their career would recall the buoyancy afforded by that predicament. There are no expectations. You run free. That year Jigmet finished third in the elite category for Indian women. Tsetan completed the race in fourth position, the two separated at finish by a mere four seconds. Then, the uphill began. You have podium position to live up to. At a café in the Mumbai suburb of Bandra, some days after the 2019 Tata Mumbai Marathon (TMM), Chewang Motup put his project in perspective. Motup owns Leh based-Rimo Expeditions, among the best known adventure travel companies in India and organizers of the Ladakh Marathon. He started the Ladakh Marathon with a simple goal in mind. In distance running which counts on endurance, training at altitude is recognized as helpful. As location, Ladakh enjoys high average elevation; much of it is over 9800 feet high. Born to altitude, people from here should have a bank of endurance. Rigzen Angmo is good example. In the 1990s, she ran sub-three marathons, was podium finisher at national and international marathons. But that was years ago and a case, not repeated since in Ladakh. 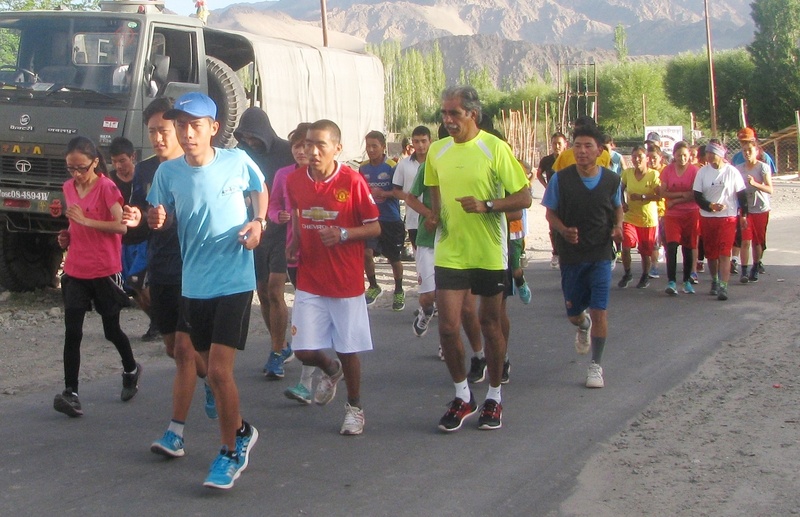 Motup wished to unlock the potential for endurance running in Ladakh by encouraging a culture of running. He also wanted to see local runners representing India at the Olympic Games. Hence the choice of the marathon for unlike the ultramarathon more easily associated with Ladakh’s mountainous landscape, the 42.195 kilometer-distance is firmly recognized as Olympic sport. Hailing from Igoo village, Jigmet was into running while still at school. But it was the Ladakh Marathon staged in Leh at an elevation of over 11,000 feet that brought her (she used to run the half marathon) and Tsetan to local prominence. Although their early timings are quite slow compared to the pace at which marathons and half marathons are run in India’s cities, they were consistent podium finishers in Leh. 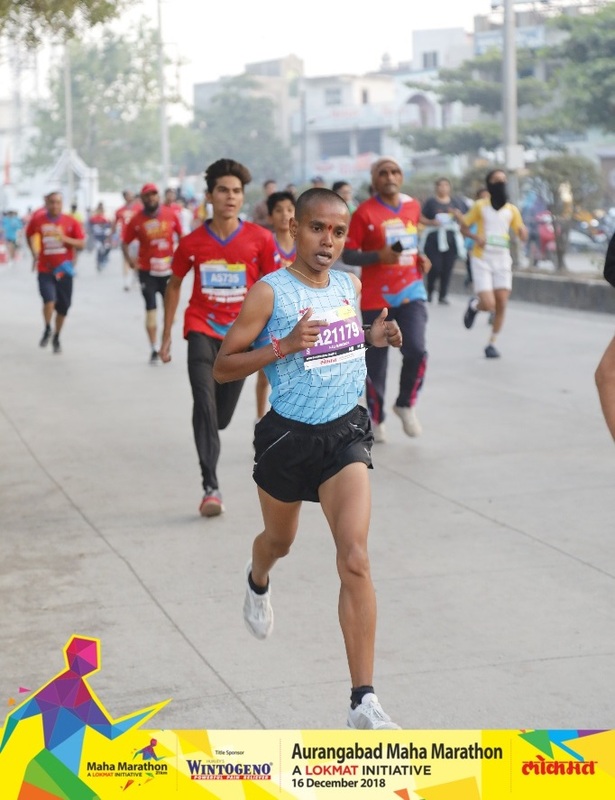 Rimo Expeditions pioneered an annual program for Ladakhi runners – selected on the strength of their performance at the Ladakh Marathon – to travel to races at Indian cities with the Mumbai Marathon as main focus. “ My first visit to the Mumbai Marathon was in 2013,’’ Jigmet said. After a couple of years spent participating in the half marathon at the event, in 2015 (so she recalls), she ran the first full marathon of her life in Mumbai. “ I ran it at half marathon pace and ended up walking the last three kilometers to the finish,’’ she said outlining the lack of experience she had in races and race strategy then. 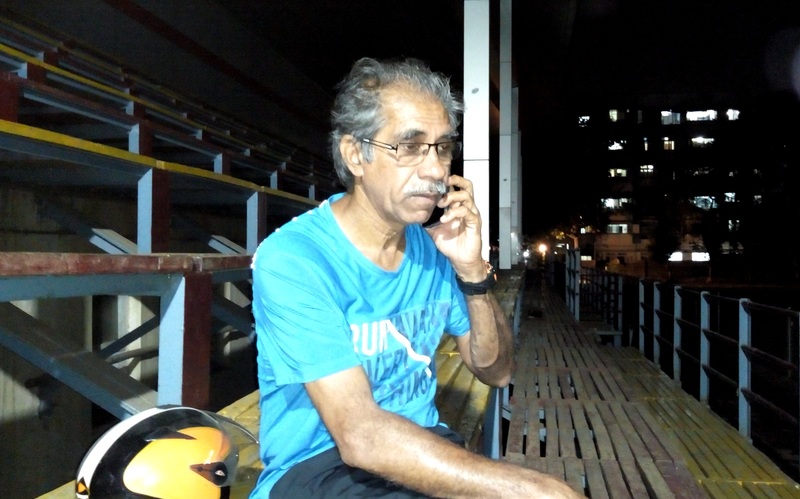 In the period that followed, Savio D’Souza – former national champion in the marathon and well known coach in Mumbai – was brought in to train the team. A structured approach was introduced. Given Ladakh’s cold winter with sub-zero temperatures, runners like Jigmet and Tsetan, begin their training in April. Around July, Savio visits them in Leh, gauges their standing, imparts tips and before returning to Mumbai, gives them a training schedule. “ We then keep in touch on the phone. They call me and tell me what they have been doing. The thing about them is – they are utterly dedicated. If it is too cold and they haven’t managed to run in the morning, they will run in the afternoon. I give them a training schedule, they follow it to the T,’’ Savio said. The intervention paid off. Between Tsetan and Jigmet, the latter was always the faster runner. Tsetan had completed the 2013 Ladakh Marathon in 4:54:05. By 2017, she was completing TMM in 3:14:42, four seconds behind Jigmet; both runners in the elite category for Indian women to boot. That was the year Jigmet finished on the podium for the first time in Mumbai. A week had elapsed since 2019 TMM. It was late evening. At the Mumbai University’s athletic track, the hours of training had just concluded. “ Let me explain what happened in 2018,’’ Savio said. 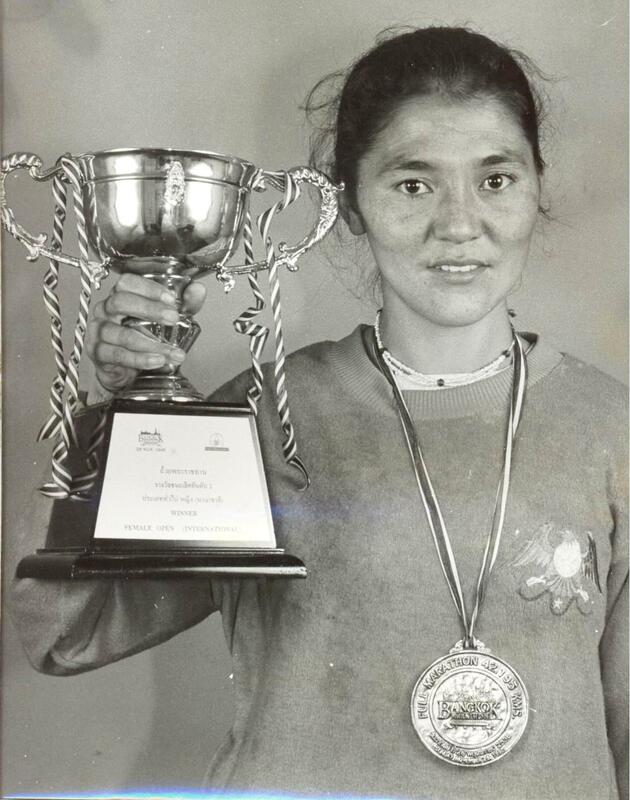 That year, the Ladakhi runners had failed to repeat their podium finish in the Indian women’s elite segment. “ The podium finish of 2017 was unexpected. Next year, it became a burden. Ahead of race their discussion was about who had turned up to compete in the elite category. If you run to defeat others, you end up running someone else’s race. You have to stick to your plan. But the whole thing was new for them. They were under pressure. When you run under stress, you commit mistakes; your race plan goes haywire. That’s what happened in 2018. Last year they got distracted by the elite runners. This year was different. They ran their own race. The attitude was – whoever comes, we are not bothered. Now we will do better,’’ Savio said. At 2019 TMM, Jigmet was back on the podium in the Indian women’s category; she placed third with a timing of 3:10:43, Tsetan finished fifth clocking 3:13:05. With podium finish secured for the second time, it appears both Motup and Savio have to contemplate: what next? Dr Aashish Contractor was Medical Director of the Mumbai Marathon from 2004 to 2014. Now Head of the Department of Rehabilitation and Sports Medicine at Sir H.N. Reliance Foundation Hospital, he produced a photo on his computer showing the Ladakhi runners from a 2018 visit to the hospital to assess their VO2 max level. “ VO2 stands for volume of oxygen – it basically tells you how much oxygen your body can consume while doing exercise. It is considered to be a gold standard of one’s cardiovascular fitness. For someone to do well on the world stage in long distance running, cycling, swimming, rowing or skiing – they must have a very good VO2 max. We tested six Ladakhi athletes. All of them had phenomenally high numbers, definitely world class,’’ Dr Contractor said. But it has to be seen in proper perspective. As the doctor put it, you can’t be a world class athlete without good VO2 max but high VO2 max does not automatically guarantee that you will be world class athlete. Between the two – potential and performance – lay other factors like circumstances; training, mental strength, diet, experience and strategy. VO2 max is therefore an indication of potential, especially endurance. “ That’s the most important attribute you can measure in a distance runner,’’ Dr Contractor said. At the apartment near Mumbai’s Chhatrapathi Shivaji Maharaj Terminus (CSMT), where the runners from Ladakh stay, Jigmet reflected on what she required to improve. “ My weaknesses are two. First, I am still slow compared to other elite runners. Second, I tend to run a marathon like a half marathon. My pace progressively drops,’’ she said. Figures prove her correct on the first and marginally correct on the second. At 2019 TMM, both Jigmet and Tsetan had pace across splits ranging from 13.1 to 13.5 kilometers per hour. This compares with Sudha Singh (winner among elite Indian women) who straddled 16-16.3 and Jyoti Gawate (second among elite Indian women) who ranged from 15.3 to 16. As regards splits, Jigmet was fairly consistent barring minor variations, which is actually good. Both Sudha and Jyoti had pacers. “ My goal now is to run a marathon in three hours,’’ Jigmet said. Savio wants her to get there on her own steam, without pacer. “ Using the word speed can be misleading,’’ Dr Contractor said. All running involves speed. In a marathon you have to sustain decent pace for the two and half to three hours that the run lasts. This can be viewed as a case of endurance. But can high VO2 max – often cited to highlight endurance – be construed to also imply promise of maintaining good pace for the duration of a marathon? “ It is hard to answer it directly. Let’s put it this way – if you took a roomful of 50 people and you tested all for VO2 max and you made them all run five kilometers, it is likely that their performance would be in the order of their VO2 max roughly. If you train them all equally, they have the same circumstances in life – then again, the result would be the same. But if you take away those variables and everybody eats differently; lives differently – then there is the possibility that somebody with low VO2 max may beat somebody with a high VO2 max. Mental strength, how badly they want it – so much goes into it,’’ Dr Contractor said. In a competitive marathon, there are several elements at play – among them: endurance, race strategy and pace. Motup’s ongoing project is founded on the premise that Ladakhis have good endurance. Rimo’s team of runners brings that to the table. Not just that; team members couldn’t recall an instance of Did Not Finish (DNF) from their ranks, ever since they started traveling out to races in the plains. Both Motup and Savio said that no matter what difficulties they faced, the runners typically finished a given race. Between the two critical attributes – endurance and pace – pace would also seem an animal inspired in part by ecosystem. Endurance grows in you as part of location and lifestyle; probably why residents of hills and mountains end up with superior endurance compared to plains dwellers. Pace on the other hand – one can legitimately suspect – feeds off competitive circumstances too. In Ladakh, there is only one marathon – the Ladakh Marathon. In a region with few popular initiatives in athletics, the Ladakh Marathon has been consistently topped by the likes of Jigmet and Tsetan. Given it is one of India’s most expensive marathons (acclimatization schedule forces long stay in Leh for participants) elite runners from the plains don’t turn up to participate even as a matter of curiosity to pitch their ability against high altitude. The event’s USP revolves around running in Ladakh, the adventure tourism destination. It has come to enjoy a high level of attraction among foreign runners with travel companies marketing packages around the annual marathon. It has also extended the local tourist season with hotels booked and high spending visitors – Indian and foreign – in town. Simply put – although local runners win the race comfortably, beyond a point neither the event nor the local ecosystem in running can serve as robust proving ground for the events of the plains because the required level of competition is absent. And without runners as good as you or better than you around, local runners needn’t feel compelled to push themselves. The ecosystem contrasts the circumstances runners from the plains hail from. But that is where Ladakh’s runners are for most part of the year; they come out to compete in city marathons for only around four months every year. When they leave Ladakh for the plains in November, Rimo’s team of Ladakh runners – especially those running in elite category – make a jump to truly competitive environment instead of gradual transition. This was particularly felt in the run up to 2019 TMM because Delhi’s prestigious half marathon, which the team likes to run for accumulating race experience, got shifted to October. According to Savio, the team needs to participate in more races; there is also the need to have more races happening in Ladakh as that is runners’ home ecosystem. More local races contribute to bigger pool of local runners and hopefully thereby, greater competition for existing top notch runners in Ladakh. The breeding ground of most Indian marathoners is the middle distance categories (reference here being to 3000 meters to 10,000 meters) including the steeplechase. Indian elites like Nitendra Singh Rawat, T. Gopi, O.P. Jaisha, Sudha Singh and Lalita Babbar – all spent time in middle distance disciplines before coming to the marathon. It was true of the late Shivnath Singh too whose national record in the men’s marathon, set in 1978, was still standing at the time of writing. The great Emil Zatopek’s competence spanned 5000 meters, 10,000 meters and the marathon. Ladakh’s running calendar lacks a basket of middle distance races. Competitive ecosystem and middle distance – isn’t that where speed is picked up and ingested into potential marathon runner’s system? Both Sudha Singh and Jyoti Gawate (Jyoti who finished the full marathon at 2019 TMM in 2:45:48 hails from challenged circumstances) have more race experience than Jigmet. Sudha who has won medals for India internationally, has the ecosystem of the national camp – an assembly of India’s best – to train in. Further, both Sudha and Jyoti don’t have to worry about weather while training. “ When I go to Ladakh we do some speed training on the road. But road is not ideal surface as it can cause injury. Ladakh does not have an athletic track and so far, we haven’t been able to locate a good mud track. Further once the runners leave Ladakh for the plains, given races they are scheduled to participate in, we have to train conservatively making sure to avoid injury,’’ Savio said. Motup hopes he can pitch in to bridge the deficit with an array of treadmills to keep the momentum of training going on in Leh even in times of inclement weather. But the gap in infrastructure is clear. A bit of a mystery in the story of Ladakh runners is the relation between altitude and distance running. Most people seem agreed on the link between altitude and endurance. But on the other hand, marathons have been increasingly won by those hailing from or training in mid-altitudes, not high altitude. India’s high altitude sports training facilities are also at these mid-altitudes as are the hills and mountains the elite runners of Kenya and Ethiopia belong to. Iten, the famous home of distance runners in Kenya, has an elevation of 7874 feet. Having said that, it must be pointed out that the Internet (to the extent this writer looked it up) did not specify a clear reason why training is set at this belt of elevation, apart from mention that it corresponds to where the best athletes currently hail from and also, where some of the high profile competitions are held, the latter likely in terms of threshold of elevation (for instance – Mexico City, location for the highest altitude at which the Summer Olympics have been staged so far, is at 7350 feet). For runners from Ladakh, the question is how to leverage their natural strengths, train and perform well at altitudes lower than where they come from. They need to marry endurance and pace. For this, do they train high (as in Leh) or train low? Can you simplistically conclude that if the middle altitudes are good for training in long distance running, then still higher altitudes would be better? “ No. Not necessary. You go very high, the air gets rarified; it is difficult to train. Living at altitude is beneficial. Everybody living at altitude will have those beneficial changes compared to you and me. But to be able to train – sometimes the altitude is so high that you get tired. Then training itself becomes difficult. How do you do your sprint workout and your long distance workout and all of that? I think there is a sweet spot as to what altitude is good to live and train at,’’ Dr Contractor said. The story of Rigzen Angmo is characterized by training stints outside Ladakh at gentler altitudes (please visit this link for Rigzen’s story: https://shyamgopan.com/2015/09/28/the-spectator/). Her personal best of 2:45:42 set in 1996, is looked up to by the runners from Ladakh. For dwellers of altitude, long stay away from elevation is a tricky quantum. One sensed unease in the runners when the question of extended stay in the plains was discussed. Apparently, such extended stay temporarily saps high altitude residents of some of their strengths at elevation. On return to Ladakh, they find themselves needing to adapt afresh. It isn’t a development the young runners seemed comfortable with. Savio feels it is time the national authorities took note of this project, which has systematically dispatched runners to Mumbai since 2013 and secured podium finish in the elite category, twice. If they make it to the national camp or at the very least its proximity, the top Ladakhi runners will get the ecosystem to improve their performance further. They will have good facilities and most important, the good fortune of running with those currently better than them in the marathon. “ I wish the authorities took note of how far we progressed despite the challenges faced,’’ Savio said. Motup is acutely aware of the stage the project finds itself in. Rimo Expeditions has funded this journey as well as the Ladakh Marathon, from its own resources. 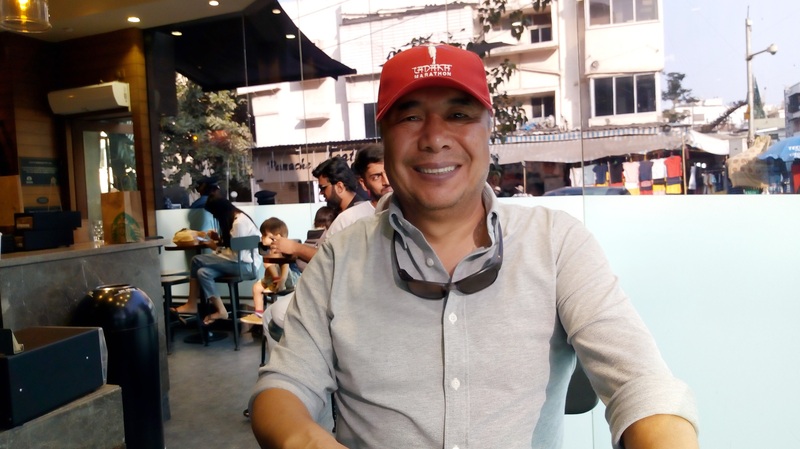 As someone who wishes to see a Ladakhi at the Olympics, he wants more races in Ladakh – a sort of feeder system into the Ladakh Marathon, much the same way the best performers from the Ladakh Marathon find their way to TMM. But that deepening of running culture can’t be done by him alone. Ideally it should be a broader campaign involving local government. At a more immediate level, as a matter of strategizing next stage for the current team of Ladakh runners (including more time spent away from Ladakh if that is the need), one avenue open to him is to get aboard a strategic partner or sponsor for the Ladakh Marathon. Either such move frees up Rimo’s resources to invest more in the running team or whoever decides to partner the Ladakh Marathon, buys into the idea of sustaining and growing the running team as well. In today’s world of sports those willing to associate for visibility or gains in marketing are easily found. What’s tough is finding someone for the long haul of investing in a running team or a project to grow running and see it through. “ So far I haven’t met anyone convincing in this regard,’’ Motup said.